The Penn State Extension announced that they will hold their next workshop in their Hard Cider Business and Production workshop series at the beginning of the new year. This workshop, Hard Cider from Seed to Sip, will be held on February 1, 2016 from 1pm-5pm at The Vineyard and Brewery at Hershey in conjunction with the Mid-Atlantic Fruit and Vegetable Conference. Eric Shatt has a degree in Agrobiology and is Cornell University’s Orchard and Research Farms Manager. His passion is making hard cider and tending his own biodynamic orchard. Redbyrd Orchard Cider is a family-run orchard and cidery that grows heirloom, wild seedling, and European cider apples to produce distinct hand-crafted ciders. Denise Gardner is the Penn State Enology Extension Associate with years of experience in the wine industry and two wine quality certifications: Certified Specialist of Wine (CSW) certification from The Society of Wine Educators, and the Level 3 certification from the Wine and Spirits Educational Trust (WSET). Gardner focuses on a range of sensory expertise and production options associated with various fermented beverages, including hard cider. Carla Snyder leads an effort to bolster new and diversifying hard cider producers with the skills and research they need to start and expand their business. She assisted in forming and serves as an advisor to the Pennsylvania Cider Guild, a new trade organization for Pennsylvania cider producers geared towards education and promotion of the industry. Mary Bigham is an award-winning publisher and producer of culinary content. 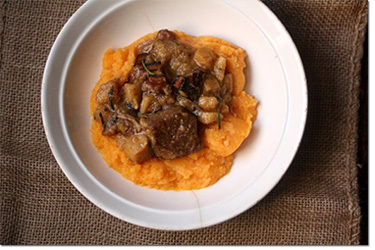 Dish LLC operates TheTownDish.com, an online food and lifestyle publication and Dish Works, a culinary content agency. This intensive workshop will also include a benchmark tasting of fruit ciders lead by Penn State Enologist Denise Gardner. Following the workshop networking and socializing with cider makers and industry professionals will be available. Advanced registration is required. Cost is $120 per person and includes the benchmark tasting. For more information and to register, click here or contact Erin Dugan at ekd5153@psu.edu or 717-334-6271. Photo from Alexandra Whitney Photography. Woodchuck, Winter Chill (VT) – This limited release cider is Woodchuck’s winter offering and is only available from December to January. The cider has a warm amber color and has a fresh apple and vanilla note in the nose. It is slightly tart with notes of vanilla, light spice, and oak for flavor brought on by the aging process in French oak barrels. Weighing in at 5% ABV, this cider is more sessionable than other aged ciders. Rekorderlig, Spiced Apple (Sweden) – Apples, vanilla, and cinnamon on both the nose and palette mix to create Rekorderlig’s cozy winter cider. This cider is surprisingly only 4.5% ABV but it works to its advantage making it a versatile cider that can be enjoyed either cold or hot on a cold winter night. Downeast, Winter Blend (MA) – Downeast’s newest winter selection perfectly demonstrates how to balance crisp apple with spices while not making any one flavor overpower another. This lightly carbonated unfiltered cider comes in at 6.5% ABV and uses cinnamon bark and nutmeg to bring upon all of the wonderful winter flavors. Virtue, The Mitten (MI) – Nothing says winter quite like the oaky vanilla scent of charred bourbon barrels. Virtue Cider Co. wrapped these aromas over a semi dry cider and gifted us a wonderful “warming” cider, complete with a slight maple back note. At 6.9% ABV this is sure to please any cider drinker’s palette as the snow starts to fall. Cider Creek, Winter's Cinn (NY) – This unfiltered cider is a perfect beverage to have with friends this winter and at 6.9% ABV it is sure to keep everyone in jolly spirits. The cider is made with Bavarian yeast which brings on lovely notes of pear, plum, and banana. The winter specialty is then matched with cinnamon and spice rounding out the cider with vanilla back notes. J.K.’s, Cuvee Winterruption (MI) – Lightly spiced with ethically traded cinnamon, vanilla and a drop of maple syrup, the cider pours a tan color with fresh apple, cinnamon, maple syrup, and honey on the nose. The cider is clearly spiced but still balanced.This cider has a 6.9% ABV. Jack’s, Fireside Cider (PA) – This seasonal cider has a 5% ABV and is available from November – March. Itis packaged in an eco-friendly can which means it’s good to take this cider on the go this winter whether you’re going skiing or building a snowman. The cider is spiced with vanilla, ginger, cloves, and cinnamon subtly with characteristics of Jonagold, Ida Red, and Rome apple varieties shining through. Vander Mill, Nunica Pine (MI) – Aromas from this cider will make you feel like you are standing in a snow covered forest, lumberjack flannel optional. This limited release seasonal cider brings about a delicious earthiness thanks to the introduction of Columbus hops. It is a pale yellow cider that has a perfectly balanced sweetness with acidity and bitterness, plus complex notes of green apple and pine. This cider comes in at 6.8% ABV. Adirondack, Double Tap Maple (NY) – Adirondack takes an interesting approach with their newest winter cider adding fresh New York State Maple syrup, one gallon of syrup to each gallon of cider to be exact. That’s a lot of maple! This 5.4% ABV cider has notes of sweet apple with a prominent maple flavor. This cider is on the sweeter end with a little funk on the back note. Doc’s Draft, Cranberry Spice (NY) – If the snowflake on the label doesn’t convey the message that this is Doc’s Draft’s winter cider, the taste definitely will. The addition of fresh cranberries and spice is abundant. 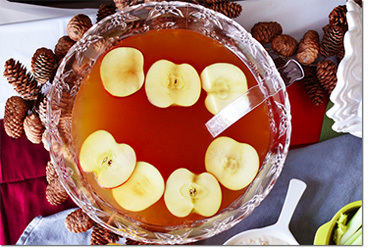 The first thing you can notice is aromas of ginger, cinnamon, cranberries, and apple. The cider has a light pink hue with light carbonation. The tart notes of the cranberry blend perfectly with the sweetness of the apple and it all ends with cinnamon. This cider weighs in at 6% ABV and is a perfect winter warmer. 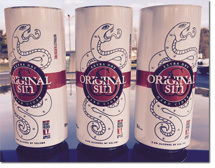 Original Sin Cider announced its entry into the canned cider market with the release of Original Sin Extra Dry Cider. Made in New York State, Original Sin Extra Dry Cider is produced exclusively with 100% freshly pressed New York apples. Renowned for its traditional dry ciders, Original Sin kicks off its 20th anniversary with the addition of a new can line to their award-winning line-up of bottled ciders. Original Sin Extra Dry Cider will initially be available starting January 10, 2016 in seven select states: Washington DC, Illinois, Pennsylvania, Ohio, Maryland, Florida, and North Carolina. The national launch of Original Sin Extra Dry Cider in more than 30 states, including New York, will commence in April 2016. New York State has a deeply rooted history of apple production. It was home to the first commercial nursery in the United States and it’s currently the second largest apple producing state in America. New York boasts 694 commercial orchards, generating 29.5 million bushels of annual production while curating the most diverse selection of apples in the country -- many of which are iconic heirloom apples. Original Sin is proud to release its first canned cider on the market utilizing 100% New York State apples. Original Sin Extra Dry Cider is a complex and well-balanced sessionable cider with 5.5% ABV. With its minimal residual sugar, Original Sin Extra Dry Cider appeals to seasoned cider aficionados seeking a drier pub-style alternative. An apple enthusiast in his own right, Gidon Coll (Founder of Original Sin) tested a wide range of New York apple varieties to develop a distinctive blend. Original Sin Extra Dry Cider includes Ida Red, MacIntosh, Jonagold, and several russeted apples. Hard apple ciders are in the midst of a renaissance and New York State is now a hotbed with dozens of cideries releasing exceptional new products. A standout addition to Original Sin’s portfolio, Original Sin Extra Dry Cider features the best locally sourced New York produce. Original Sin Extra Dry Cider celebrates Original Sin’s 20 year venture as one of America’s foremost cider brands. Legend – Due to its extremely limited quantities, this semi-dry cider made from both heritage and dessert apples is a once in a lifetime cider as it is the first small batch cider the company has ever made. All apples used in this cider were picked in 2013, bottled, and then the finished cider was allowed to age - 6.9% ABV. If you see a bottle of this cider, grab it while you can as once it is gone it is gone for good! Perry (2014) – This dry European-style perry comes in at 6.1% ABV and is entirely made with Barlett pears. The perry has a pale straw color and subtle pear notes on the nose and palette. Besides making great cider, Rootstock also cares for the environment and has put systems in place to ensure nothing goes to waste. They are sustainable in that every part of the fruit gets used and every by-product along the cider manufacturing process gets reused in some way, this allows nothing to go to waste. As if this were not a big enough dedication to being environmentally friendly, the cidery also uses solar energy to power it! The cidery runs about 90% off of solar power; the percentage goes up in the summer with more daily sun. Rootstock emits an almost absent carbon footprint while still putting out some amazing complex cider. All of the ciders in the line are well worth a try! 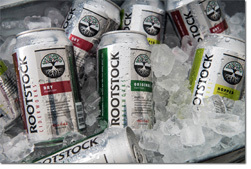 Go check out Rootstock Cider in their tasting room at 3274 Eddy Road, Williamson, NY or on RootstockCiderworks.com. You can now also find Rootstock Cider at select Wegman’s locations! Photos courtesy of Rootstock Ciderworks. U.S. Senator Charles E. Schumer announced that a number of vital tax benefits for New Yorkers were included in the Protecting Americans from Tax Hikes Act of 2015, known as the tax extenders package. This must-pass legislation includes the CIDER Act, legislation which he initially introduced to lower the excise tax imposed on hard cider and help boost New York’s growing hard cider industry. 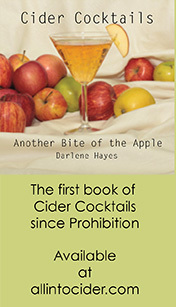 Under current federal law, the outdated definition of hard cider only allows for hard cider’s alcohol content to reach up to seven percent alcohol per volume before it is taxed at the higher rate of wine, and only a certain level of carbonation before it is taxed at the even higher rate of sparkling wine. With the passage of the CIDER Act, the definition of hard apple cider and pear cider would be changed in the Internal Revenue Code. This would increase the allowed alcohol by volume, and thus allow more hard cider products to be labeled and taxed like hard cider instead of the costlier tax structure for wine. Schumer urged his Senate colleagues to pass the CIDER Act in order to boost the sales for New York’s increasing number of hard apple cider producers and allow the hundreds of apple growers in the state to expand their business and add this popular craft beverage to their product line. In February 2015, Schumer announced the Senate Finance committee passed the CIDER Act; bipartisan legislation he first introduced in 2013. Now, the CIDER Act is included in must-pass tax extenders legislation. Schumer explained that the alcohol content of New York’s hard cider fluctuates greatly due to sugar content, and current law often forces it to be taxed at a higher rate, preventing it from being labeled as hard cider. Under current federal law, the outdated definition of hard apple and pear cider only allows for up to 7 percent alcohol by volume before it is taxed at the higher alcohol per volume rate of wine, and only a certain level of carbonation before it is subject to the champagne tax. Schumer said that many of New York’s hard cider producers are small craft hard cider operators, and because they rely on natural products, there is very little predictability and control over the precise alcohol content of their product. In addition, some consumers of hard apple cider expect a high level of carbonation as a substitute for beer, and current federal tax law doesn’t permit the desired amount without classifying the product as champagne. In both cases, hard cider often falls into different beverage categories, which makes ciders subject to higher alcohol excise taxes, and complicates labeling issues. By providing this revised definition for hard apple and pear cider, increasing the alcohol by volume from 7 percent to 8.5 percent and carbonation level allowed, producers and growers could encompass significantly more hard cider products. This would allow their products to be labeled and taxed like hard cider, rather than wine. In 2013, Schumer first argued this would allow the over 650 apple growers and 20 existing hard apple cider producers at the time to expand their business. Producing hard cider offers major benefits to apple orchards, whether they choose to increase production and add additional acres of “hard cider trees,” or if farmers simply use existing products to diversify their business. Most importantly, apple and other fruit growers who have suffered from frosts and bad weather in recent years have benefited from adding hard cider into their business model, as it is not nearly as susceptible to these unpredictable occurrences. Some producers grow specific varieties of apples to produce hard cider, while other producers can use apples from their crops that have been damaged by storms. Hard cider can also be made from apples that are high quality, but that are not as aesthetically pleasing to sell on a farm stand, and that would otherwise be sold at a loss or thrown away. In addition, hard cider is a value-added product, and can reign in significant value for producers than simply selling the same apples. Hard cider is sold around the same price every year; therefore it gives producers a stable source of income when apple crops suffer due to weather and other unforeseen factors. 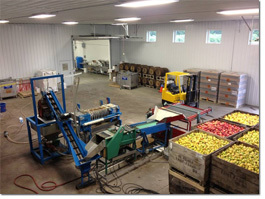 New York apple producers are increasingly interested in producing smaller, artisanal batches of hard cider, but cite the cost and difficulty to comply with the IRC definition as significant impediments to expanding their businesses. Schumer said the federal definition of hard cider under the IRC is restrictive to both current producers as well as those hundreds of growers that would like to enter production of this craft beverage. New York is the second largest apple producer nationwide, harvesting a total of 29.5 million bushels annually from over 650 farms and 41,000 acres across the state. In recent years, thanks to the growing popularity of hard cider, many apple producers have turned to producing this craft beverage to keep apple orchards profitable. You can continue the momentum CIDER Act has gained by reaching out to your congressional representatives to thank them for their support or let them know about CIDER Act and why it is important to the cider industry and you. You can find a listing of the current co-sponsors by clicking here. For sample letters and instructions on how to find your congressional representatives and their contact information, please visit the United States Association of Cider Makers website at CiderAssociation.org/cideract. 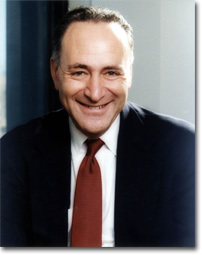 The above article was provided via press release from Senator Schumer's office. 2 Towns Ciderhouse released its 2013 Pommeau this month—a port-style cider perfect for capping off a feast or sipping fireside. This 19% ABV cider yields notes of dried apricot, oak-barrel character and subtle hazelnut, as well as aromas of crème brulee and light tobacco. 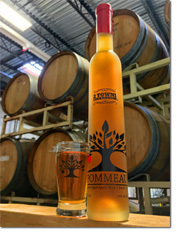 Pommeau was previously produced by 2 Towns’ sister company, Traditions Ciderworks. Past vintages were honored with multiple awards from the Great Lakes International Cider & Perry Festival and Sip Northwest Magazine’s Best of the Northwest. To create the Pommeau the cidery pressed Dabinette, Porter’s Perfection, Kingston Black and a variety of other apples for a robust blend of juice that’s high in fermentable sugars and rich with complex tannins. They then took the blended juice, lightly fermented it, transferred it to oak barrels, fortified it with apple brandy and aged it for over a year. 2 Towns Ciderhouse used brandy distilled from their own cider and aged the Pommeau in barrels previously used for chardonnay, pinot noir, sauterne, muscat and brandy. Fewer than 500 cases of 375ml bottles of the 2013 Pommeau were produced. It will be available in limited quantities in Oregon, Washington, California, Idaho, Nevada, Minnesota and Chicago. Fortunately, 2 Towns Ciderhouse just announced its partnership with Craft Beer Guild Distributing of San Diego (CBGSD) to distribute its ciders throughout San Diego County, so those in San Diego may even find the Pommeau. Previously, 2 Towns ciders were available on a limited basis in the county. San Diego County stores, bars and restaurants will now have access to the 2 Towns full lineup of ciders, including flagship BrightCider, Bad Apple, OutCider, and Made Marion, a blackberry cider. 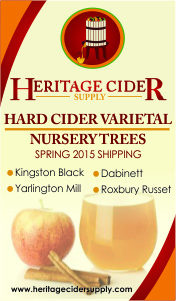 In addition, the company’s seasonal, limited-release and specialty ciders will be available for local enjoyment. Unfortunately, 2 Towns Ciderhouse is still not available nationwide though so check out 2TownsCiderhouse.com for availability near you. In November 2015’s e-newsletter, there was an article titled “Black Cider” that stated Flying Monk Brewery created what they believe to be the world’s first black cider. This statement was from Flying Monk Brewery’s own research. After Hard Cider News released the article, the editor was informed that 101 Cider House has been producing a cider called Black Dog since August 2015. Flying Monk Brewery released their black cider in February 2015.